Around 11:00 a.m., my husband looked out the window. It’s been snowing since early this morning. Numerous robins are finding shelter in our garden, on our front porch, and in our magnolia tree. They are actually all around the houses next to us and across the street as well. 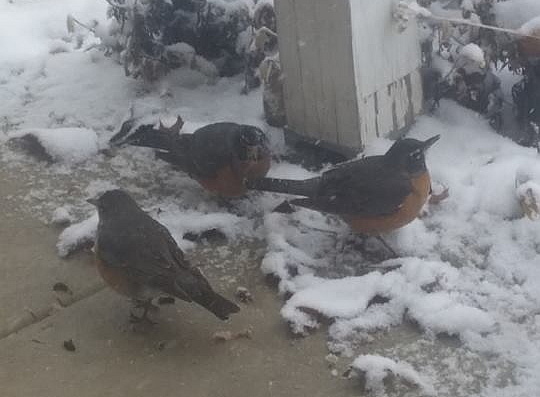 We weren’t sure they were robins at first, as they are all puffed up. A friend told us that many birds puff up when they are cold. I’m guessing it insulates them and keeps their organs protected. Birds can symbolize good things and bad, depending on the bird. Robins have always been associated with spring – a time when death passes away, and life begins again. That’s why we celebrate Easter in the spring, because Jesus rose from the dead a couple days after Passover. Symbolic interpretations of birds usually mean the prophetic, or the Kingdom of Heaven. Other meanings include the work of the Holy Spirit and angels. But they can also symbolize the demonic. 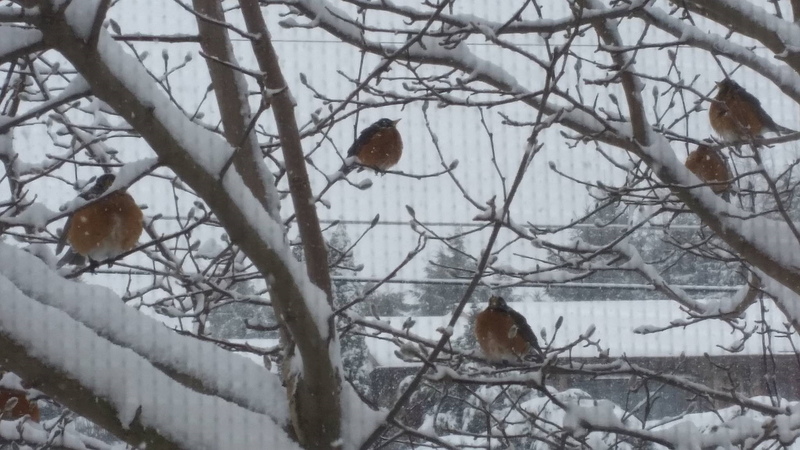 I believe the robins in the snow today symbolize in the natural realm a few things in the spiritual that may happen in the near future. Any symbol God uses can have positive or negative connotations. POSITIVE: increase of prophetic, increase in spiritual activity, a refreshing and life-giving season is ahead. NEGATIVE: a lot of bird poop says cleansing is necessary to continue on. My ministry school director felt this: “I’d say spring has come/is coming in your life…and to get fruit sometimes you have to deal with a little poop.” SNOW: favor and/or mercy will be coming your way. I believe God is showing us that a new season is upon us – a season of rebirth and refreshing. This season will be an eternal work of the Kingdom of God, and there will be an increase in prophetic and spiritual activity associated with it. Great grace, mercy, and favor will accompany this time. Cleansing and freedom will also characterize this season.